Program Director, Eron Dupree from Chicago, IL. Eron has been a part of the summer camping program since 2003 and has served as director for the family weekends, ADDaM, Chi Rho, and JYF camps. While not at camp, Eron is a music teacher and choir director for the Chicago Public Schools. He is staying in the Dining Hall Loft or can be found around the campground, if you need him. Looking for recreational activities? Try the volleyball court, basketball court, and we have plenty of open field space. Also, don’t forget our water activities (swimming, paddle boats, canoes, and fishing). Just review our waterfront policies. You can also enjoy a hike on our wooded nature trails. Just ask our camp host or directors for more information. If you are looking for peace and quiet, try the chapel on the south side of the lake where we will be celebrating worship, or walk to the chapel on the north side. You will also find the meditation labyrinth on the north side field. We look forward to seeing you and your family throughout this weekend. Listed below are some basic policies to keep in mind during your stay here at Camp Walter Scott. On the other side of this page, you will find some scheduled activities that you and your family are invited and encouraged to participate in throughout the weekend. 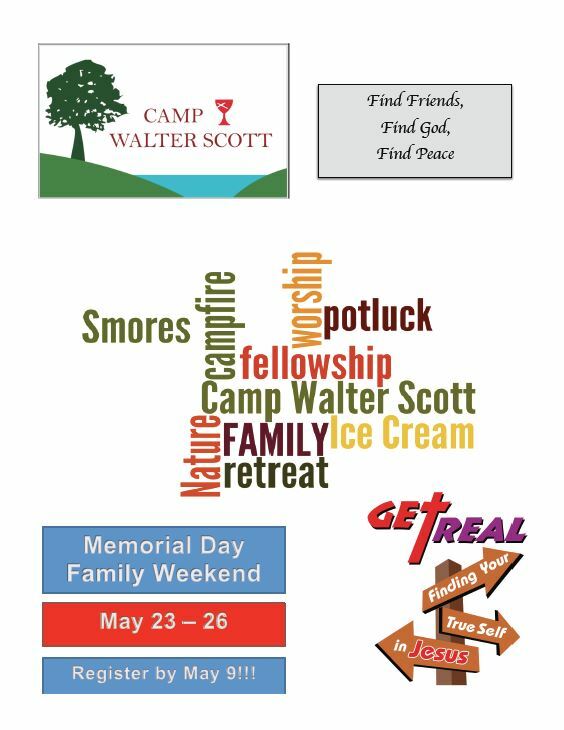 We are excited that you have decided to be ere at Camp Walter Scott for a weekend of rest, relaxation, and restoration. When arriving at Camp Walter Scott, please check-in with the camp host. Pets are to be kept on a leash or a lead at all times. Clean up after your pet. Pets are not permitted in camp buildings. Quiet Hours are between 10:30 p.m. and 8:30 a.m.
Use available tire rims to contain fires. Do not leave unattended fires burning. Life jackets are required for anyone boating on the lake. Parents must supervise all their children’s lake activities. There is no lifeguard on duty. Camp Walter Scott is an alcohol-free campus and smoking is allowed in designated areas only.